September is a crazy busy month for this lady. September means a busy work schedule, a busy school schedule for the kids and this year, it also means a crazy busy holiday schedule in our house. The Jewish holidays sprung early this year. On one day, it meant searching high and low for the last protractor on this side of New Jersey, while also looking in the depths of every market for a new fruit I haven’t yet eaten. On other days, it anchors me to my kitchen, dividing my time between my laptop and my stove. I do love this season of Jewish holidays though. As the cool air creeps in, there is this beautiful air of celebration and anticipation of the fall holiday season. Or maybe that’s just the pumpkin spice lattes I’m smelling. Whatever it is, the mood changes. Life is busy, but in a good way. I recently celebrated the holiday of Rosh Hashanah (the Jewish New Year) as well as the holiday of Yom Kippur (Day of Atonement). Both of these holidays provide me with ample time for reflection and appreciation of the past year as well as the year to come. After the crazy roller-coaster I was on this winter, I am so appreciative and thankful for my good health and for all of the support I had from my friends and family. They’ve been there for me, and I love them for it. This month’s Kosher Connection link-up is all about Spreading the Joy during this holiday season. I want to share my challah with you. Ever since I was a kid, I have looked forward to Shabbat with my family. Friday night dinner with the family is sacrosanct. You don’t mess with that tradition. It’s not about level of Jewish observance. You just find a way to be at the shabbat table with family and friends, celebrating the end of the week together. Shabbat has been the constant in my life. Through my own various cycles and changes in my own Jewish observance, Shabbat has always meant “home” at the end of a long week. We come together on Friday evening and light candles, and then sit down together for a warm meal – over good food, good wine, and good company. This includes challah. Our special holiday and shabbat bread. I may not be a baker, but I love making challah. I love the process of working with the dough and getting it just right. I also love some of the spiritual rituals that come with making challah. In Jewish communities around the world, people come together while making challah and use that time to pray for health and wellbeing for loved ones. While preparing the dough, it us customary to keep in mind the names of loved ones who may be unwell or possibly need a job. We say a blessing while keeping the names of these people on our minds. This past month, I’ve had the opportunity to make challah a few times. Each time, I’ve made challah with a friend who had never made challah before. Somehow, when you make challah around others, it makes this ritual all the more special. My favorite challah recipe is adapted from a recipe that I found on a bag of flour. Over the past several years, I have tried numerous challah recipes. I’ve had several failures and several successes, but this recipe that I am sharing with you, is a recipe that always results in good challah. You can dress it up with whatever topping you’d like. or you may like to fill it with apples or chocolate chips, like I did for our Rosh Hashanah challahs. On some cool fall days, I have also been known to add some roasted garlic to the mix. Just play with it, and enjoy! Place yeast, sugar, honey and warm water in to a large mixing bowl or in the bowl of your mixer. I used a Bosch for this recipe. Allow the yeast to sit a few minutes until it bubbles. Add about 6 cups of the flour and mix in to a paste. Add eggs, ½ cup of oil, vanilla and the salt. Stir together. Add the rest of the bag of flour and knead for several minutes. The dough may be a little sticky. Add the 2tbsp, of oil and knead a few more minutes. If you are using a machine, turn the dough on to a floured counter and knead a few more minutes. You may need to add an additional half a cup of flour. The dough should be smooth and easy to work with. Oil large bowl and brush oil on the top of the dough and place in the bowl. Cover the dough with a clean kitchen towel or with plastic wrap and allow the dough to rise in a warm place for around 45 minutes. You will need to punch the dough down halfway through. The dough should double in size. At this point, you can take challah. Now is the time to shape your challah. I love the various braiding tutorials on the Challah Blog. 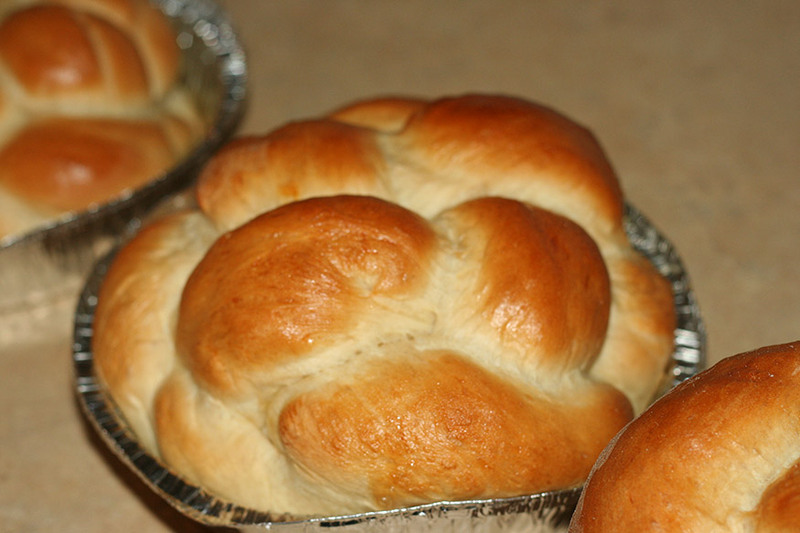 Once you've shaped your challah, cover your challahs with plastic wrap or with towels, and place in a warm spot. Allow the challah to rise for another 40 minutes. Preheat your own to 350. Brush your challah with an egg wash. Now is the chance to add any toppings like sesame seeds, poppy seeds and other goodies. Bake your challah at 350 for about 40 minutes. When you tap on yoiur challah, it should sound hollow. That's a sign of doneness. About a year ago, a group of kosher food bloggers came together as a group. We call ourselves the Kosher Connection. As a group, we have grown and learned a great deal from each other as food bloggers. We’ve supported each other and have been sounding boards for each other throughout the year. I am so glad we all got together. Since the group started, we have come together monthly for various themed blog challenges. For our anniversary challenge, we are doing a blog swap. Each kosher blogger has been assigned another kosher blogger to seek inspiration from. We are challenged with choosing a recipe from that blogger’s blog and making it our own. I was super excited for this blog swap. I had no idea what to expect. I was pleasantly surprised when I was tasked with coming up with a recipe from Chanie Apfelbaum’s blog – Busy in Brooklyn. I mulled it over for a while and studied her blog intently. What would I make? I have already cooked a few of her recipes and all have been wonderful. Her recent recipe for chili and cornbread was amazing! What would I make this time? At first I thought I bought veganizing her Sesame Noodle dish. But I realized that was cop-out for me. I make sesame noodles often and swapping out chicken for tofu wasn’t much of a challenge. I decided to turn one of her meat dishes in to a vegan dinner. 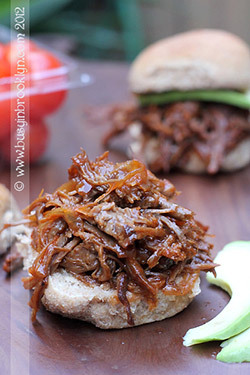 From around the kosher blog world, I knew that her BBQ Brisket was a huge hit. What if I took the flavors of that dish and made it vegan? I knew that I could pull something similar off with seitan. I love that her ingredients are simple and something I would already have on hand. I played around with the quantities a bit to make it work with the seitan. I cooked up about a pound of seitan in advance – about a day before. You can easily use prepared seitan with this dish as a shortcut. I am so happy I chose to make this dish! The flavor was fantastic and was a huge hit with the family. Even the picky kid ate it, gobbling it up quickly. To celebrate the 1-year anniversary of the Kosher Connection, we are giving away two prizes from Emile Henry, a Bread Cloche valued at $130 and a 4.2 qt Dutch Oven valued at $170! Use the Rafflecopter below to win- you can enter up to 23 ways! Two winners will be chosen at random. Be sure to check out the rest of this month’s Kosher Connection’s bloggers below! Heat up the olive oil in a large saute pan. Add in the onions and garlic and cook a few minutes, until it softens. Add a teaspoon of the salt and pepper to that mix. Chop of the seitan in to thin pieces and add to the pan. Let the seitan brown a bit. Add in the mushrooms and cook a few minutes. In a small bowl, mix together the ketchup, the apple cider vinegar, the vegetable stock, worcestershire sauce and the rest of the spices. Pour the mixture over the seitan mixture. Stir everything together. Let some of the liquid cook off a bit. This will only take about 5-8 minutes on medium-high heat. 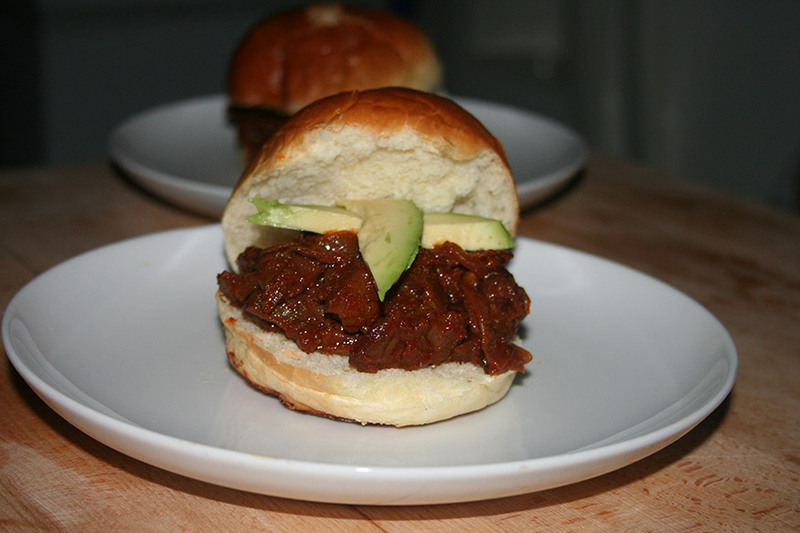 Serve the pulled seitan on buns or in a wrap along with some avocado. A cole slaw would be a great way to give it some needed crunch. A few years ago, I had some random chunks of bread that were taking up space in my freezer. I had company coming over and it occurred to me to turn that leftover bread in to a casserole or bread pudding of sorts. I am not a big fan of sweet bread puddings, so the savory version seemed like the right course of action. The bread pudding was a huge hit at that brunch. Fast forward a few years. I recently found myself planning Shavuot meals. On Shavuot, it is customary to eat dairy meals. I decided to turn back to that bread pudding I made a few years ago. We still love it and I decided to share it here. Heat up the olive oil and butter in a large sauté pan. Add in the onions, garlic and leeks and sauté for about 3-5 minutes. Add in the sliced mushrooms and cook for another few minutes. Stir in the fresh herbs, salt and pepper and cook another two minutes. Cook until all of the veggies have softened. Remove from heat and set mixture aside. While the veggies cook, you can quickly prep the bread cubes and get to work on those. Spray a large baking sheet with olive oil spray. Place the bread cubes on the baking sheet and bake for about 10-15 minutes, or until the bread cubes start to brown. In a large mixing bowl, mix together the eggs, broth, half and half, additional spices, half of the parmesan cheese and half of the shredded cheese. Add the lightly toasted bread cubes to the egg mixture. Stir the vegetable mixture into the egg mixture. Let the mixture sit for about 20 minutes. Pour the mixture in to a 9"x13" pan. Sprinkle over the remaining cheeses. Bake in oven for about 25-30 minutes or until pudding is set and cheese starts to bubble and brown. Remove from oven and let sit a bit before serving. My daughter asked me to stop sending her yogurt for school lunches. Yogurt made things easy. She was happy with yogurt. She had a full belly from yogurt. She asked me to send in sandwiches instead. Alrighty, then! Sandwiches it would be. I decided to whip up a batch of some sandwich bread to avoid running out to the bakery and spending unnecessary coinage. I figured that I could use this to my advantage. I have been wanting to make a whole wheat bread that has a somewhat nutty texture – reminiscent of the awesomely nutty Great Harvest bread.. I didn’t want too much stuff in the bread. This kid is not a huge fan of texture. Great Harvest is a bit too much, but somewhere on the right path. This could be used as a transition bread. She is ready to graduate out of the whiter whole wheat soft breads that we tend to buy for her. I came up with this, which seems to be a happy medium for now. In the bowl of a mixer, dissolve the yeast in the warm water. Add in the honey and brown sugar. Let the mixture sit for a few minutes. Stir in the soy milk and vegetable and half off the flour. Slowly mix in the rest of the flours. Mix in the flax seed and the oats. Dough should be coming together and pulling away from the bowl. Sprinkle your work surface liberally with flour. Turn the dough out on to the surface and knead for several minutes. Add flour as needed. Form in to a big round ball. Oil a large mixing bowl and place the dough in there to rise. Cover with a towel or saran wrap. Let it rise in a warm place for about an hour. When risen, cut dough in half. Shape the dough in to a loaf and place in sprayed loaf pan. Cover and let rise for another 45 minutes. While this is happening, preheat your oven to 375. With a serrated knife, slash the top of the loaf. Spritz with a bit of water on top and sprinkle on some oats. When I think of summer, I think about backyard barbecues. The weather is usually just right at this time of year. It’s not too hot and humid yet. You can still enjoy the outdoors. Of course the day I pick for BBQ, is the day it pours all day. When there are barbecues, there are burgers. In the past, I have just grilled some Morningstar Farms Grillers. I get annoyed with the cost, and how they are lacking in flavor. I have played with a variety of homemade veggie burgers. One version that was a success with some of my toughest critics, is a black bean burger. I normally pair a black bean burger with a simple tortilla – only because I have always have them around the house. As I was thinking about burgers though, I had juicy burgers on soft buns pictured in my head. As I strolled through my local store though, all I could find were some really pathetic looking, chemical filled, shelf-stable buns. Not what I wanted. As I walked home dejected, it occurred to me – how hard could it be to make my own homemade buns? It’s just a simple enriched dough. I was right, it was easy – and totally worth the smidgen of effort. Dissolve yeast in warm water and milk. Add the sugar. Let it sit for a few minutes. Turn dough on to a floured surface. Knead more flour in to the dough until the dough becomes elastic. Dough should be smooth and shouldn’t be so sticky. With a dough cutter, cut dough in to 12 pieces. Spray 2 baking sheets with oil spray. Shape each piece of dough in to a ball and place on baking sheets. Let the dough balls rest for ten minutes – covered with a towel. Brush the dough with egg and sprinkle with sesame seeds. Bake in the oven for around 10-12 minutes. Remove buns from baking sheet and transfer to cooling rack. Place the beans in a large mixing bowl. Mash most of the beans with a potato masher. Keep some of the beans whole. Add the rest of the ingredients to the mixing bowl. Mix well. Grill on a barbecue or pan fry in a small amount of oil. Enjoy with as many or as few fixings as you’d like. While wandering the streets at lunchtime, I often eye the ethnic food carts. So many wonderful (and some not so wonderful) smells coming out of those carts. Two of the most popular falafel vendors, Alan’s and Sam’s, have the craziest lines snaking from the carts. They even serve a tasty little treat inside each bag when you order an overstuffed falafel sandwich. Included in the bag is a greasy piece of crisp pita. Sam’s even has a bowl where you can help yourself to these tasty treats. Those crispy pita chips are such a tease. We don’t have too many decent kosher options in the area where I work – let alone kosher falafel carts. Moshe’s used to come by, but they disappeared about a year ago. So I’m left on my own in the world of falafel sandwiches. I offered to make the family some falafel the other night. Nobody was interested. When I suggested making some homemade pita to keep on hand though, the ears perked up. Homemade fresh pita is so much better than the store-bought and it comes together fast. Place the yeast in a large bowl. Pour the warm water over the yeast. Let it sit for a couple of minutes. Add salt, olive oil, and 1.5 cups of flour. Stir the mixture in to a paste with a wooden spoon. Stir in another 1.5 cups of flour. Turn on to a floured surface and begin to knead. While kneading, add flour as necessary until the dough is not sticky anymore. The dough will still be soft and pliable. When ready, form in to a large ball shape and place in a lightly oiled bowl. Cover with plastic wrap or a towel and let it sit for about 30 minutes or so – while the oven heats up. Turn the oven to 465. Cut the dough with a dough cutter in to around 8 equal pieces. Form the dough in to balls. Roll out the balls until around 1/4 inch thick. Make sure that the rounds aren’t any thinner or they won’t have that lovely pocket effect. Spray the tops of the dough with a bit of water and olive oil mixed together. Not too much – just a couple of drops to keep moist. Let the dough rounds sit for about ten minutes. During that ten minutes or so, heat up your heavy baking sheet. Take a spatula and turn 3 dough rounds at a time on to a baking sheet and place in the oven. Keep the oven light on so you can watch the magic that happens inside your oven. The pitas will begin to puff up. At about 5 minutes or so, the pita will be puffy and will have browned a little on the bottom. The pita should be ready. Place on towel or platter to cool. Enjoy your pitas with falafel, hummus or whatever your heart desires. Stay tuned for some tasty treats that will be made with this yummy pita! The big kid is not a demanding eater by any means. She doesn’t like things too complicated, but also doesn’t really beg for new things to make or try. When she does think of something new to make, I try to oblige. She keeps telling me about pizza sticks with sauce or cheese sticks with sauce. I think she was inspired by one of the school lunches she saw kids eating. When we go out for pizza, she gets pizza and doesn’t venture out of that routine. So I know she didn’t get it from restaurants. Anyhow, I promised her I would make some when I had the chance. 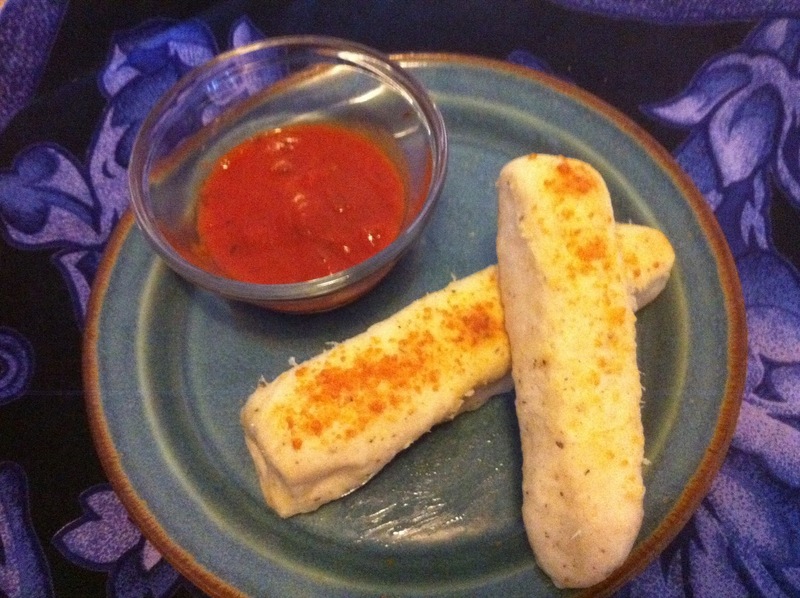 I came up with a breadstick base – similar to my pizza dough recipe. Stuffed some cheese in it, and baked. Was pretty easy. She said it was the best lunch ever! Add the yeast to the bowl of a mixer. Add the warm water and milk. Let it sit for a minute. Add the rest of the ingredients and stir. Mix until the dough starts to form a ball and pulls away from the bowl. Knead the dough and form in to a bowl. Place in a lightly oiled bowl and cover for about 5-10 minutes. Roll the dough out on a floured surface. Slice the dough in eighths. Roll out the slices a bit. Fill with cheese and seal the bread sticks. I found that wrapping it like a burrito works well. Let the breadsticks rest in the pan for about 5-10 minutes. Brush the breadsticks with olive oil and parmesean cheese. Serve breadsticks with a side of marinara sauce. Would also be good with a nice aioli. Enjoy! I don’t remember ever having a breakfast sandwich until I moved to New York. Don’t get me wrong. We ate breakfast in Minnesota. They had Egg McMuffins (shudder) there as well. They just don’t have all the greasy delis, bodegas, and carts where you can order that classic egg & cheese on a roll. If I ate breakfast out in Minnesota, it was usually two eggs – over easy, with a side of hash browns and toast. If I wanted to shake things up a bit, there were always omelets and pancakes. My father is a master omelet maker. Still, there is something to being able to go to a corner store and pay a guy $1.50 to make a greasy sandwich – that also serves as a really tasty hangover cure. Fast forward a few years. When I was pregnant with my daughter, I had huge cravings for egg sandwiches in the morning. I decided to start searching for that perfect breakfast sandwich. I still haven’t found it. I haven’t found anyone who gets all the parts just right. If the bagel or roll is good, then my luck – the eggs are overdone. Or the cheese is all wrong. I don’t need much. A toasted english muffin or roll with american cheese, two eggs, salt, and pepper. That’s all it takes. I have done bagels. Rolls are easy. 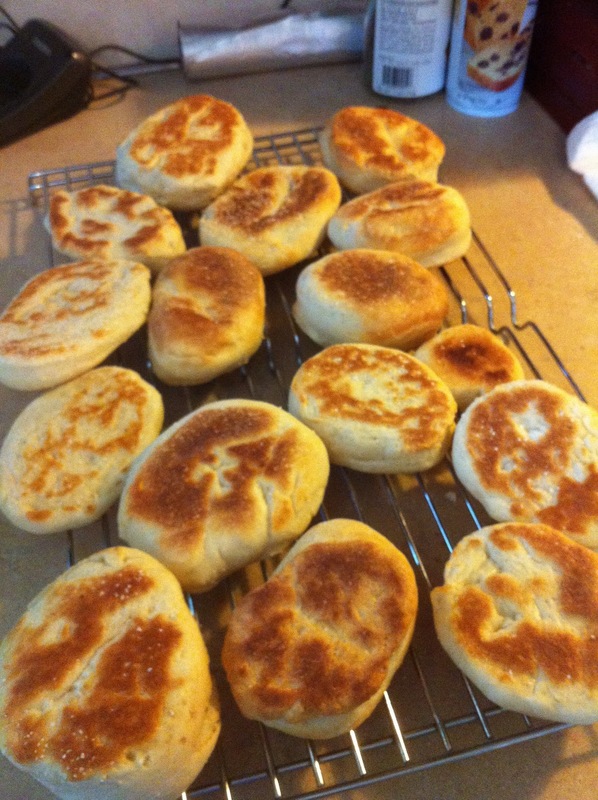 I had never done English Muffins. Growing up, we often used to eat the classic Thomas’s English Muffins. With all its nooks and cranny goodness. I decided I had to make something like that. I studied dozens of recipes online and in my various baking cookbooks. I researched flour and muffins rings. It didn’t seem too complicated. I simply procrastinated. I finally dug in. Sunday morning was D-Day. It really wasn’t hard to do. Was fun to make – and tasty too! If using active dry yeast, combine the water, yeast, and a pinch of sugar in a small bowl and let stand until foamy, about 10 minutes. If using instant yeast, as I did, you can just mix the yeast in with the flour and omit this first step and the sugar. Combine 2 cups of the flour and the salt in a large bowl. Make a well in the center and pour in egg, milk, butter, and yeast mixture. Mix until creamy, about 2 minutes. Add the remaining flour 1/2 cup at a time, stirring in each time, until you have a soft dough that just clears the sides of the bowl. Turn the dough out onto a floured work surface and knead for 3 to 5 minutes. Return the dough to a clean, greased bowl, cover with plastic wrap, and allow the dough to rise until doubled in size, about 90 minutes. Sprinkle a work surface with cornmeal. Pour the dough out of the bowl and onto the surface. Sprinkle the top of the dough with cornmeal and then roll the dough into a rectangle about 1/2 inch thick. Use a large round cookie cutter or an upside down drinking glass to cut the muffins out of the dough. Heat a large skillet over medium heat. Place the muffins onto the skillet and let the bake for 5 to 10 minutes until quite dark before flipping. 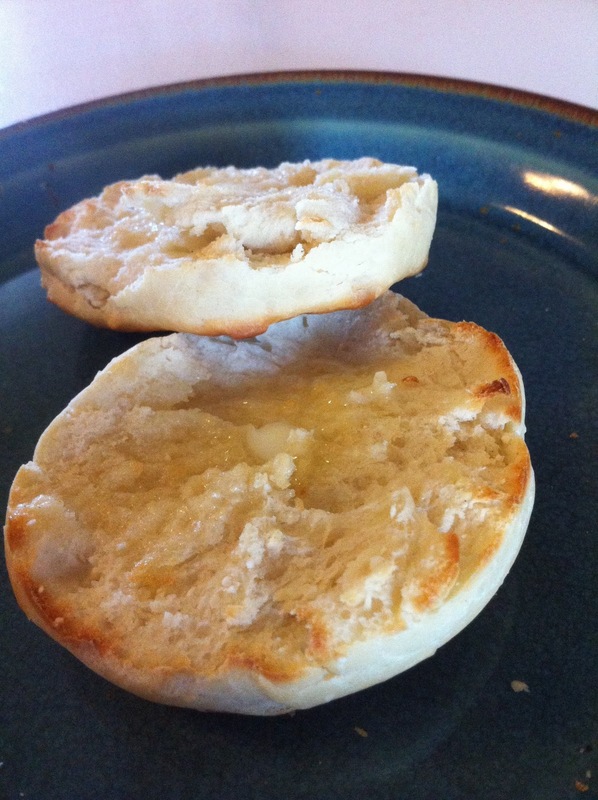 I threw my english muffins in the oven for a few minutes to finish the baking process. Cool them on a wire rack when out of the oven. Serve toasted with butter as I did on Sunday, or as a breakfast sandwich with egg and cheese as I intend to do tomorrow morning. Enjoy! Check out all the nooks and crannies here! I was debating whether or not to post this challenge. I already made bagels a while ago for the blog. These bagels didn’t come out as planned, so I was a bit embarassed to post them. Alas, this is the Bread Baker’s challenge. Not all recipes will come out as intended. The challenge is to create and share. As far as the flop, I know where I flopped. I overproofed and underglutenized the dough. This flop should not happen again. The bagels didn’t taste bad – they just weren’t right. This bagel recipe is quite different and a bit more complex than what I posted a month or so ago. This bagel is intended to be a two-day adventure. You start the process in the early evening hours, and finish up in time for breakfast the next morning. You start with a sponge made up of high gluten flour, yeast, and water. The sponge will grow and grow, and keep growing until it’s ready to be used. You then mix up the rest of the ingredients, including the special barley malt syrup. This dough should get stiff. You must knead the dough well. Helps the dough and helps you get a good workout at the same time. Divide the dough into 4oz. balls of dough for the bagels and let them rest a bit. Poke the holes in the bagels and let them rest a bit, but not too long, so as not to overproof. Do a “float test” on the bagel. You are checking to see if the bagels are ready to go to sleep in the fridge for the night. If they float, you cover the formed raw bagels and stick them in the fridge. Clean up a bit and go to sleep. In the morning, you are ready to get going again. Get your oven preheated, and the pot of water with malt syrup and/or baking soda added, ready to boil your bagels. While you wait on the oven and the water, have some coffee. Boil the bagels for 1-2 minutes per side, then add your toppings, and then in to the oven they go for 10 minutes. Let them rest for a bit to cool down. Enjoy! The second bread in the Bread Baker’s Apprentice Challenge is the Artos bread. The Artos is a Greek Celebration bread. Traditionally, this bread is served as a Christmas bread, referred to as Christopsomos bread. In the Christopsomos version, the bread is typically studded with nuts and dried fruit, then formed into boule decorated with a pretty cross. Knowing that the family is not a huge fan of fruity, nutty bread, I chose to do the basic Artos version. The Artos is an enriched and spiced bread. I learned how to make a poolish with this bread. A poolish is a type of a starter. You combine yeast, water, and flour and let it sit on the counter for a few hours until bubbly ripe, then transfer to the fridge for at least a day until you are ready to bake. This poolish is a precursor on the baking knowledge scale to a more traditional sourdough starter or barm. As far as putting this bread together, it reminded me a bit of challah until the spices were added. I added cloves, cinnamon, all spice, and almond extract. I formed the bread into a boule. While baking, this bread smelled heavenly. I took it out of the oven. The thing was huge! We cut into it as soon as we could. We were both a bit underwhelmed. It wasn’t a bad bread. The consistency and flavor were spot on. Just wasn’t crazy. That’s ok with me. It was still fun and I learned a bit. I am excited for the upcoming BBA recipe – bagels. Peter Reinhart’s bagels seem like a step up from the bagels I made a short while back. Hopefully that will fare better to our palates.